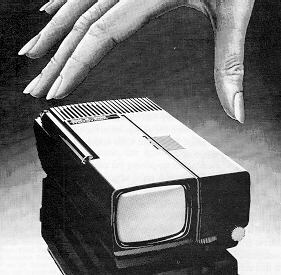 After its abortive launch in 1966, the Microvision miniature television disappeared into Sinclair's development laboratory for another decade before finally making it to the market. Still advertised as the Microvision, though formally called the TV1A to distinguish it from its prototype predecessor, the device was first launched at the end of 1976 in the United States. The design of the TV1A was significantly different from that of the prototype. AEG Telefunken of Germany had developed a miniature cathode ray tube exclusively for Sinclair, while the bulk of the electronics had been custom-designed for Sinclair Radionics. In hindsight, the TV1A was a notable departure for the company, which hitherto had depended on adapting existing components; now it was developing its own hardware. This was a significant step forward, paving the way for the much more ambitious hardware development programmmes of the 1980s. Also unusually for Sinclair, normally an unashamed populist, the TV1A was aimed initially at the business / exective market with a cost of $400. Weighing some 26 ounces, this made it - ounce for ounce - more costly than solid silver. The device was 4" wide, 6" deep, and 1.5" high, powered either by rechargeable batteries or from the mains. The black-and-white picture could be viewed comfortably from about a foot away. It functioned on VHF and UHF bands and was the first-ever multi-standard receiver, which meant that it could be used in nearly every foreign country as long as the country used one of the three major TV standards. Unfortunately for Sinclair, demand outstripped supply (not for the first or the last time) and by the time a sufficient number of TV1As were coming off the production line at the break-even point of 4,000 a month, demand had slumped and unsold stock built up rapidly. The backlog of 12,000 TV1As was eventually resolved by selling them off cheaply. This resulted in a £480,000 loss for Sinclair at a time when the company could ill afford it. Sinclair himself was certain that the "new and improved" TV1B - a more efficiently designed model, launched in the autumn of 1978 - would take off, causing demand to spiral and saving the company. The TV1C and TV1D were, respectively, US and European variants of the TV1B, adapted to work with the local television systems. A mini-monitor, the Mon1A (right), was also produced, based on the TV1A hardware and housed in a very similar case. In the event, the gamble failed. The TV1B/C/D was the last product from the Sinclair Radionics stable. In July 1979, the National Enterprise Board - Sinclair's government backers - finally got fed up and pulled the plug on the company. Sinclair received a £10,000 "golden handshake" and set up Science of Cambridge instead. The rights to the TV1B were sold to Binatone, but the product was soon dropped.